When should critical realists care about drive structure? This Lacanticles blog aims to share the background thinking to the blogs on asymmetric design and asymmetric leadership. Recently I was asked: “What additional benefit is to be derived from the formalisations in Lacanticles? What do these forms of analysis add beyond the use of the practices described in your other blogs? And when are even those practices of sense-making and interpretation a useful precursor informing action?” Given that the Lacanticles already contain a presumption that a Lacanian reading of Freud is of some use – a presumption that is certainly not widely shared (!) – these are good questions that I try to address below. The quick answer to the question in the title? Because they need to be able to describe the conditions surrounding novel emergence as it is experienced in the behavior of a social entity exhibiting agency. The critical realism of Roy Bhaskar points out that the observer is implicated in the construction of any models s/he attributes to the behaviors s/he observes in the world. Thus there is a domain of the ‘actual’ events happening in the world of the observer, an ’empirical’ domain of the observer’s experiences, and a ‘real’ domain of causal processes that may or may not manifest themselves in the ‘actual’ domain, whether or not these ‘actual’ events are experienced by the observer. So I may ‘really’ have carcinogenic chemicals in my body. These chemicals may be giving rise to ‘actual’ events amongst my body’s behaviors. And I may experience some of these events ’empirically’ as symptoms of something not being right with me. A model is some formalisation. Its entailments within the formal domain are designed to commute with ’empirical’ events (i.e. the logical conclusions that can be drawn from the model are designed to correspond to the events). If an experimental design can separate out ’empirical’ events against a backcloth of ‘actual’ events in such a way as to establish this relationship, then the model can be said to ‘explain’ causal processes in the ‘real’ domain. So cancer research has shown that there is a correlation between the presence of chemical X in the body and the incidence of cancer Y, on the basis of which I should only microwave food in plastic containers designed for that purpose. A closed system is one for which all the ‘actual’ events causing its behavior can be included within the experimental design separating out its behaviors ’empirically’ i.e. it can be isolated from its environment. In practice, most systems are open because this is not possible, a difference having to be assumed between the ‘actual’ and ’empirical’ domains of the system. The behavior of an open system may nevertheless be deterministic if, for any given set of initial events, its subsequent behavior can be predicted. Under these circumstances, we can say that we have a model of how the system ‘really’ behaves. So the behavior of a car is predictable to its driver if the conditions in which it is being driven are known. A model of an open system-of-interest is defined in relation to some ’empirical’ behaviors defined by the observer to be of interest. The 1st order model of that system-of-interest would combine all the causal processes attributed to generating those behaviors-of-interest in the ‘real’ domain. The behavioral closure of this model is all the possible sequences of behavior predicted by the model. This would be non-deterministic if the model predicted more than one possible outcome for any given initial set of conditions. A 2nd order model of relationships constraining the behaviors of the 1st order model can be added to make this behavioral closure deterministic, i.e. some form of controlling system. So to an understanding of internal combustion has to be added control systems that regulate the ways in which the engine burns fuel. The relation of the 2nd order model to the 1st order model defines what components of the 1st order model are included ‘inside’ the system-of-interest, and what components are left ‘outside’ in its environment: the 2nd order model defines the ‘organisation’ of the 1st order model and the boundary around its 1st order components i.e. we can separate out the engine assembly as a working power unit. This ‘organisation’ of a system-of-interest is emergent if the ’empirical’ behaviors of the system-of-interest cannot be explained in terms of the components of its 1st order model. This emergence is ‘weak’ if this failure to explain is because of a limitation in the knowledge of the observer about the behaviors of these components, and ‘novel’ if not. Given that the components of an open system may themselves exhibit behaviors that can only be explained by assuming emergence, we may therefore stratify open systems on the basis of this relation of embedded ‘organisation’, for example the ‘organisation’ of the engine system is embedded in the components ‘organised’ by the powertrain system, etcetera. The system-of-interest has been designed if, as in the example of the car’s engine system, the source of the ‘organisation’ of the system is external to it. But a system that exhibits agency is one for which the source of its ‘organisation’ is internal: the source of its ‘organisation’ is the conservation of its ‘organisation’ per se. Such systems are self-organising, capable of adaptively regulating the way they are coupled to their environments according to the norms established by their own ‘organisation’ of viability conditions. For example, the elephant is able to survive in a wide range of conditions, and exhibits behaviors towards other elephants that are particular to each elephant. As observers of such systems, we observe them to be individually autonomous and goal-seeking with an asymmetric relation to their environment arising from their ability to adapt their behavior to changing conditions, i.e. we understand them to be autopoietic in their relation to their environment rather than allopoietic, as in the case above of the designed engine system. These systems exhibiting agency are what Robert Rosen refers to as ‘living systems’. Which brings us to social agency. Bhaskar’s understanding of modeling means that even though I can ‘explain’ things, I-as-a-modeler am implicated in the construction of those models, regardless of whether or not we all end up agreeing that my models do in fact ‘explain’ causal processes in the ‘real’ domain: I exhibit agency when I attribute my structural models to the ‘real’ domain. Thus as a manager for example, my sense-making, analysis and interpretations will all exhibit my agency informing the way I relate to my ‘real’. But how are we to understand the relationship between my agency and structures in the ‘real’ domain? If we accept that emergence is to be expected as much in how I understand ‘my agency’ as in how I understand the ‘real’, then we must include my being an observer of the ‘personal emergent properties’ through which I constitute myself. This leads us to the reflexive conversations of Margaret Archer and the expression of my understandings of myself through my use of language, taking the form of an ‘internal conversation’ that is the corollary of my conversations with others. Discourse is taken as a defining characteristic of social systems of agents, defining as it does the ways in which these agents share understandings both with themselves and with each other. Here discursive practice is not only a social formation, but also an emergent property of people-as-agents, whose embodiment as agents affects their ’empirical’ experience and the understanding which they draw from that experience (which may or may not become articulated in language). So how are we to understand social entities as exhibiting agency? A social entity can itself act as an agent. This is the focus of theories of competitive advantage and of business ecosystems. And agency and drive apply as much to a social-entities-as-agents as they do to individuals-as-agents. Thus, to the extent that the behavior of a social-entity-as-agent cannot be reduced to the agency of its constituent individuals (i.e. that there is an emergent ‘organisation’ beyond that of its constituent individuals), then we need formalisations enabling us to think about the determinants of its choices. Such formalisations are necessary if we are to question its practices in ways that can go beyond the understandings of its constituent individuals i.e. to be able to engage meta-reflexively with those understandings. Why? To the extent that the understanding of both demand and leadership can no longer be assumed to be symmetric with the social entity’s own understanding, the social entity needs to be able to engage in triple loop learning. And to be able to support this level of learning in the behavior of the social entity, we need to be able to understand what resists that learning. It is this that brings us to need to give an account of the effects of drive structure as it applies to social entities. Andrew Collier has written a useful Introduction to Roy Bhaskar’s Philosophy. 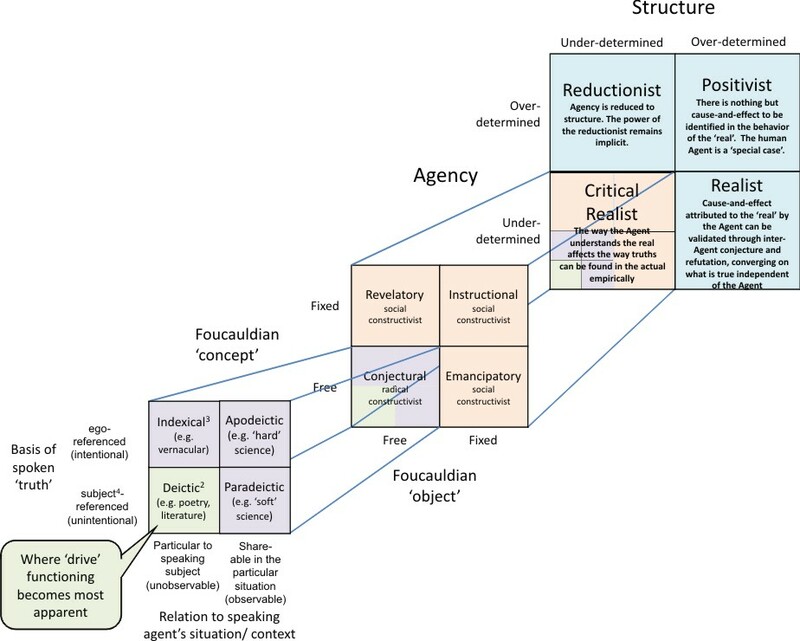 This distinguishes critical realism from reductionist, positivist and realist approaches in which the power/knowledge formations remain ‘hidden’ in the sense of being rendered invisible by virtue of the nature of the formation itself. 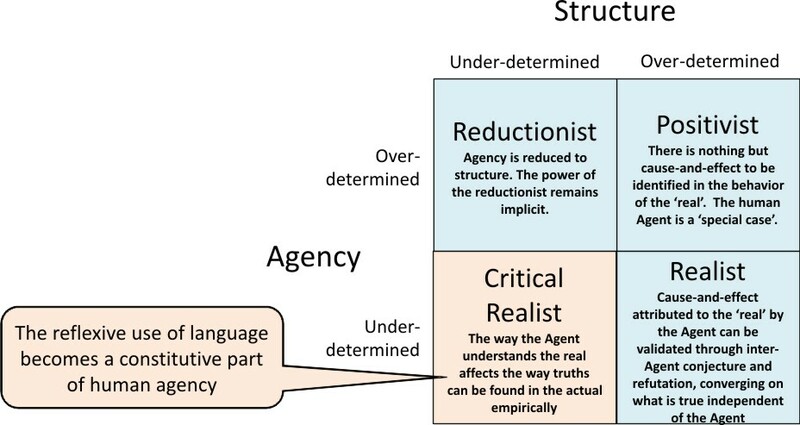 In these terms, the human agent is a critical realist for whose agency the reflexive use of language is constitutive. This way of understanding the modeling relation is described in Robert Rosen’s book on Life Itself. The self-organisation characteristic of living systems applies to all forms of agency, whether or not ‘human’. A very good insight into the ways in which living systems are self-organising can be found in Kirschner and Gerhart’s book on The Plausibility of Life, in which different kinds of living system facilitate variation in different ways. A distinguishing characteristic of ‘human’ agency is in the way the use of language affects their self-organising capabilities. ‘Model’ is to be understood more widely here than mathematical models. Bertram F. Malle in How the Mind Explains Behavior describes how each of us develops models of our own and each others’ social behaviors within the wider context of the physical world. A correlation means that there is some probability that there is a causal connection in the ‘real’ domain, without knowing what form that connection might take. This 2nd order model of relations will constitute the conditions for the continuing viability of the behaviors of the 1st order system. Naming it as ‘organising’ the 1st order system attributes it to the ‘real’ domain as being an emergent property of the system-of-interest in the ‘real’. For example, we can say that the body’s immune system ‘organises’ its defences against infection. Thus ‘weak’ emergence can ultimately be explained in 1st order terms, while ‘novel’ emergence cannot. This distinction between ‘weak’ and ‘novel’ emergence, together with the dependence of the scope of a system-of-interest on the prior definition of behaviors-of-interest, are in Alex Ryan’s paper on Emergence is coupled to scope, not level. Ryan goes on to point out that weak emergence is epistemic since once understood, it is no longer emergence, being reducible to the properties of 1st order components. This distinguishes ‘novel’ emergence as ontological because it is independent of the epistemic status of the observer. Bhaskar gives the example of the particular form of chemical interactions being explained in terms of atomic number and valency, which in turn are explained by a theory of electrons and atomic structure, etcetera. Knowledge of this stratified relation of embeddedness is thus a ‘deepening’ of knowledge. But the characteristics of novel emergence are such that this does not mean that a ‘higher’ layer can be explained away in terms of a lower layer. 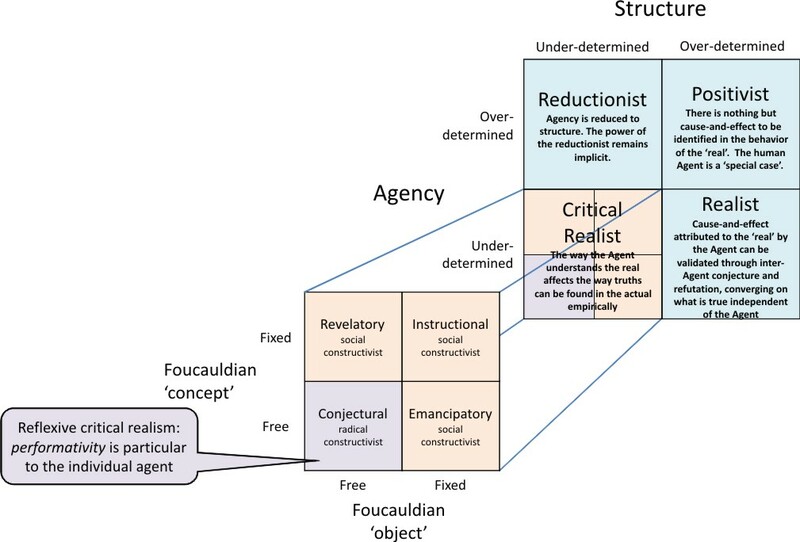 This formulation of agency is taken from Barandiaran, Di Paolo and Rohde’s work on defining agency. This work defines a system as exhibiting agency in terms of its exhibiting individuality through the particular way it is autonomously goal-seeking, sustaining an asymmetry in its interactions with its environment and conserving its identity over time (identity being defined by the sustaining of particular relations of viability). ‘Human’ agency adds to this the effects of the agent’s being in language, within which (social) medium it must sustain its identification with its embodiment. The Oxford English Dictionary’s definitions for ‘agency’ are specific to social agency, and include: (i) The faculty of an agent or of acting; active working or operation; action, activity. (ii) Working as a means to an end; instrumentality, intermediation. (iii) Action or instrumentality embodied or personified as concrete existence. (iv) The office or function of an agent or factor. (v) An establishment for the purpose of doing business for another, usually at a distance. This approach to understanding agency are to be found in Structure, Agency and the Internal Conversation, with ‘communicative’ reflexivity, autonomous reflexivity and meta-reflexivity being different relations to that internal conversation (This meta-reflexivity corresponds to the second loop in double loop learning). In her book, Archer draws on Peirce’s notion of thirdness to give an account of the particular forms of ‘organisation’ that make the internal conversation performative for the subject of the conversation. It is the nature of this thirdness that Peirce problematises in his later work with the concept of ‘irremediable vagueness’. The blogs in Lacanticles speak of ‘thirdness’ in terms of the way ‘discourse’ works, problematising discourse in terms of the concept of ‘drive’. (For more on irremediable vagueness, see Peter Ochs on Peirce, pragmatism and the logic of scripture). Embodied cognition is one line of research exploring the way our embodiment affects the ways in which we know. For our purposes, we can formulate performativity for the agent by the way s/he takes up a relation to language in terms of Foucault’s discursive practices. Particular to the agent are the enunciative modalities and unifying themes to which the agent subjects himself or herself, expressed in terms of their objects and the concepts that operate on those objects. The resulting forms of social construction differ in the ways they allow variation, the special case being reflexive critical realism – the conjectural in which the individual agent takes personal responsibility for their radical constructivism. A ‘structural hole’ is a concept developed by Atkin in the 70’s in describing the properties of relational structures and taken up by Burt in the 90’s with reference to social networks. We can think of a structural hole as confronting the observer-agent with a Lacanian Real beyond the ‘real’ of Bhaskar – something that is impossible to the observer-agent’s current understandings. When we situate ourselves in discourse in ways that are particular to the way we experience ourselves as situated, our use of language has to become explicitly triply articulated i.e. we vary its structure of substitution (paradigmatic structure) in ways that are situationally specific. This means a lot of ‘what I mean is…’ and ‘what I like to call…’ statements. If we expand on the conjectural to examine the particular ways in which the speaking subject is present in the speech act, we get the following. The ‘deictic’ parts of speech are those that indicate the presence and circumstances of the speaker or hearer as context to the communication itself, particularising the situated speech act. The ‘indexical’ parts of speech are those that rely on particular modes of reference to situation to convey meaning, the deictic parts of speech being a special type of indexical. And the ‘subject’ used here is the subject of the unconscious, i.e. a ‘de-centered ego’. This is the domain of the unintentional, to be contrasted with the intentional actions of the sovereign ego. It is on this ground that the effects of ‘drive’ structure become most apparent. By ‘meta-reflexively’ I am using Archer’s concept of an internal conversation about the way internal conversations make sense. The economy of leadership is a way of thinking about the form taken by this emergent ‘organisation’ at the level of the social-entity-as-agent. The particular form taken by this economy of leadership for any given social entity exhibits ‘novel’ emergence. Thus the social entity conserves particular asymmetries in the way it behaves – a metaphor would be to represent these asymmetries in the form of a particular coral reef. Individuals derive support for their identities by the way they take up a relationship to the way the social entity works – in the metaphor these are the various species colonising the coral reef and their relationships to both the reef and to each other. To change the social entity’s way of conserving its particular asymmetries, we therefore have to consider the ways these identifications constrain what changes are possible. The economy of leadership describes both the different ways in which identities are supported by the social entity, and also the ways in which the different forms of leadership are co-dependent on each other.